Tonight I had another accident just about 2 weeks after Sherman’s accident. Fortunately, I was NOT at fault. I was stopped at a red light and heard a screech of tires and boom, I was hit in the back end. It is such a weird feeling to have back to back accidents. Next I’ll have to have a crash in my truck to complete the trio. 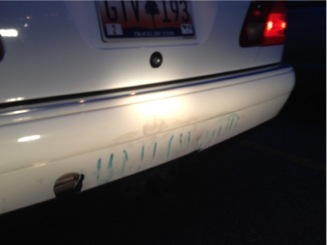 The only damage was to the rear bumper of my car. There was virtually no visible damage to the car of the other driver. My insurance company took car of everything and it is now going to the shop for repairs.